Lviv, Ukraine - Announcing that Adva-Soft, the developers of AntiCrop, has released an excitingly unique product for iPhone, iPod touch and iPad users. AntiCrop is a new launch and the first application of its kind, offering users the ability to uncrop their photos on the go. The app is enough for anyone to use, requiring users to simply drag photo borders in any direction they want to expand the picture. AntiCrop also allows photo cropping and can be used to create unique pictures. 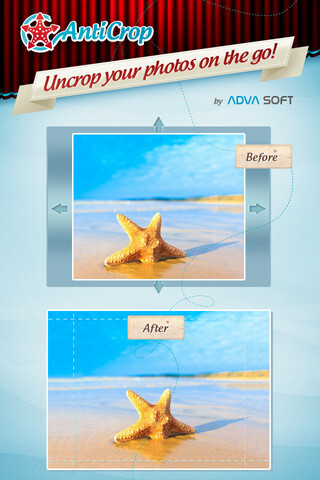 Any cropped image can be easily uncropped but Adva-Soft offers some advice for using the application. "We highly recommend the app for all kinds of backgrounds and homogeneous textures, it works great for those. People will also be really happy with the results when they are working with nature landscapes, backgrounds, portrait photos and so on, too. AntiCrop really is something that people haven't seen before," said Maksym Davydov, Adva-Soft President. In simple terms, AntiCrop recognizes elements on the outer edges of a photo then replicates them and adds border strips to the picture, enlarging it. The quality is excellent, with no discernible seams. The AntiCrop app is very easy to use and requires consumers to merely drag or tap their finger on the screen. Users are also able to crop their pictures using this application. Anyone who likes to create original pictures can experiment with the app to see where their imagination and this unique tool will take them. AntiCrop 1.0 is only $0.99 (USD) and available worldwide exclusively through the App Store in the Photo & Video category. Promo codes are available for qualified reviewers. Please specify the website or blog you represent when making your request. Adva-Soft is young Ukrainian software development company, which offers advanced software solutions for your photo editing. Copyright (C) 2012 Mobile-App-Marketing-Makeover. All Rights Reserved. Apple, the Apple logo, iPhone and iPod are registered trademarks of Apple Inc. in the U.S. and/or other countries.